Cory Guy (left) is president of family-owned TOGO Disposal. 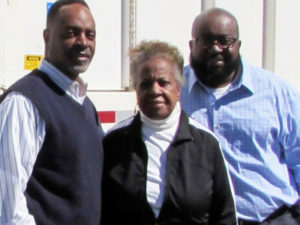 His mother, Norma, is the majority shareholder and brother, Terrance, (right) serves as vice president of operations. Cory Guy knew he needed additional trucks. Since taking over leadership of the family business TOGO Disposal in 2017 after his father’s passing, he saw opportunities to reach new customers and grow his small waste disposal company. And with more than 20 years of prior experience in corporate finance, Cory understood that access to capital was key to achieving his business goals. The federal New Markets Tax Credit (NMTC) program offered through the Wisconsin Housing and Economic Development Authority (WHEDA) was the solution Cory needed. Cory worked with the staff at WHEDA for much of the loan process. LRC came into play in the final phases to underwrite the actual loan and provide needed techinical assistance. For Cory, the loan allowed him to get new trucks, consolidate business operations in a new location, and secure additional office equipment and added technology. It has also led to new business. TOGO Disposal offers responsible and reliable removal of waste and recyclables. Learn more. Legacy Redevelopment Corporation © 2019 | All Rights Reserved | Site Design by G2 Creative Inc.